We have partnered up with our suppliers and have worked with multiple companies that are designing and producing fiber and other type enclosures. Passing the wind driven rain test (WDRT) is a major technical barrier for many enclosure manufacturers. Sponge may have been an acceptable seal prior to the WDRT but, many of the enclosure manufacturers have discovered that it doesn't meet today's requirements. Sponge will take a compression set and I know stories of WDRT failures due to the poor performance of sponge with the enclosure application. Often, a distributor can offer either non-conductive or conductive sealing solutions. The beauty of a company like United Seal & Rubber is that we can offer both. Stay with me a bit longer regarding this theme of thinking inside the box. Not only is it important to keep the outside elements away from the enclosure electronics but equally important is the EMI/RFI shielding requirements. To help our enclosure customer, we offer the following products: Extruded conductive elastomers, EMI shielded windows, Knitted wire mesh gaskets, EMI shielded vents, foil tape w/peel-off paint mask, co-extruded conductive elastomers, corrosion-resistant conductive elastomers. form-in-place conductive elastomers, conductive fabrics over foam gaskets, Be-Cu figerstock, conductive plastic/elastomer covers and shielded vents w/intumesent coating. In-house, we offer fabrication, gasket fabrication, splicing and vulcanizing capabilities. United Seal’s Quality Management System ISO-9001 and AS9100 certified and has been providing sealing solutions since 1974. The performance of our products vs. sponge has a positive effect on our customer's bottom line. The upfront cost is high enough. 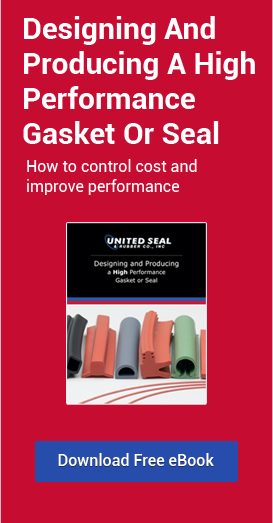 Why risk additional cost due to potential seal failure? It is all about, as I like to call it... Thinking Inside the Box. United Seal & Rubber is a veteran owned/small disadvantaged business who’s Quality Management System is certified to both ISO-9001 and AS9100 standards. Our fabrication is handled inside our factory located in Atlanta GA. We are an authorized Parker Engineered Materials Group distributor that includes all of their seal products and Chomerics line of products. Our sales staff has 10 - 50 years of experience and our goal is to make your job easier!